There was a strange sense of déjà vu in the Six Nations this year. A reigning champion dethroned with not so much as a whimper, 2019 may as well have read 2018. The scenario that Ireland find themselves in is a worrying one - not disastrous, but of enough concern that Joe Schmidt has his work cut out between now and the start of the Rugby World Cup in September to get his side back where they were. That isn't to No 2 in the world, which Wales replaced them as on Monday following their convincing Grand Slam triumph, but as World Cup challengers, because right now Ireland look in a spot of bother. When England defied all expectations to finish fifth in last year's championship and lose three of their five matches, it was immediately clear that the landscape of international rugby had changed and Eddie Jones' side had been caught out. The same can be said of Ireland. So Schmidt can take solace in that by the time England got to the autumn internationals, they looked stronger than ever through a combination of strength-in-depth and a willingness to adapt their game. What made Ireland so impressive in 2018 was their ability to stay ahead of the curve - where England, Wales and New Zealand were, Ireland were just that little bit in front in terms of their breakdown work, creativity in attack and physicality in defence. But the rest of the pack have caught them up, and after England beat Ireland at their own game on the opening weekend of the season, the worrying signs were there. "We haven't been catastrophic but we haven't been quite as good as we needed to be," Schmidt said on Saturday after Ireland failed to pull a single punch until the final play of their 25-7 defeat against Wales. "We've lost three Tests in our last 26. But to lose today is really tough. We've won 23 of our last 26 Test matches, we've finished third in the Six Nations. Once upon a time that wasn't the catastrophe that it is today for Ireland." The problem is that the reason third-place finishes are no longer acceptable for the Irish is because they are supposed to be challenging for World Cup glory - not the quarter-finals, or a first semi-final appearance, but a tilt at the whole damn thing. On the evidence of the last two months, the success of 2018 may have lulled Ireland into a false sense of security. Where previously Tadhg Furlong, Conor Murray, Peter O'Mahony and World Rugby Player of the Year Johnny Sexton were setting the pace, now they were miles off it. 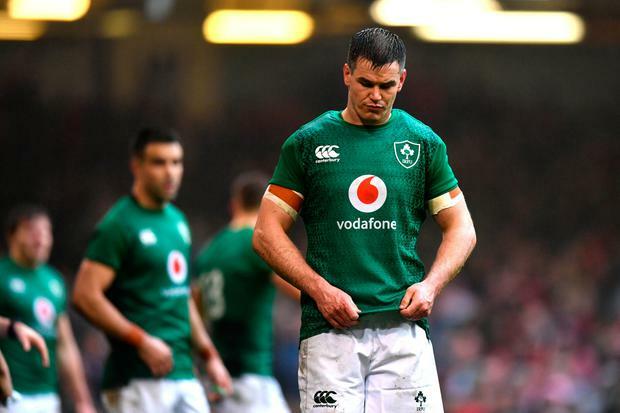 If we were talking about a one-off match such as Saturday's completely no-show, then this could easily be classed as an overreaction, but the truth is that Ireland failed to deliver a performance throughout the entire Six Nations. Even in their win over France, they were barely challenged by one of the worst French displays witnessed in the Six Nations. Even more worrying is that when the going went completely against them, Schmidt did not have a Plan B. Instead, he left an off-colour Murray and Sexton pairing out on the field in the hope of "playing them into form", as he explained after. But sorry Joe, all this achieved was to tell Kieran Marmion and Jack Carty that they're not good enough to change a game when the pressure is on, and that's a bad message to send when every single one of the 31-man squad that travels to Japan in six months' time has an integral role to play. Going back to the example of England, what did Jones do to address this? He ditched the George Ford-Owen Farrell midfield axis and put his best player in the No 10 shirt, and changed England's game to go with brute power at 12 and creativity at 13 through the use of Ben Te'o, Henry Slade and Manu Tuilagi. The gameplan was adjusted, the rugby back to basics and the results came along with the performances. Ireland already have their best man in the No 10 shirt, but we should have seen more of Joey Carbery in the starting XV against tier one opposition than the one of his 18 caps so far. Truth be told, Ireland have no idea what will happen if Sexton is having another off day or suffers injury at the World Cup. Another part of the problem, and a big part at that, is the lack of time on Schmidt's hands to address the issues. The best thing that the New Zealander can do now is treat the four World Cup warm-ups - against Italy, England and a double-header with Wales - as competitive fixtures. Throw Carbery and a few of the other fringe players such as Jack Conan and Andrew Porter in and convince them that they are playing for their place in the starting XV. It might bring the best out of them to give Schmidt his Plan B, and give Sexton and Co a kick up the backside in the process.